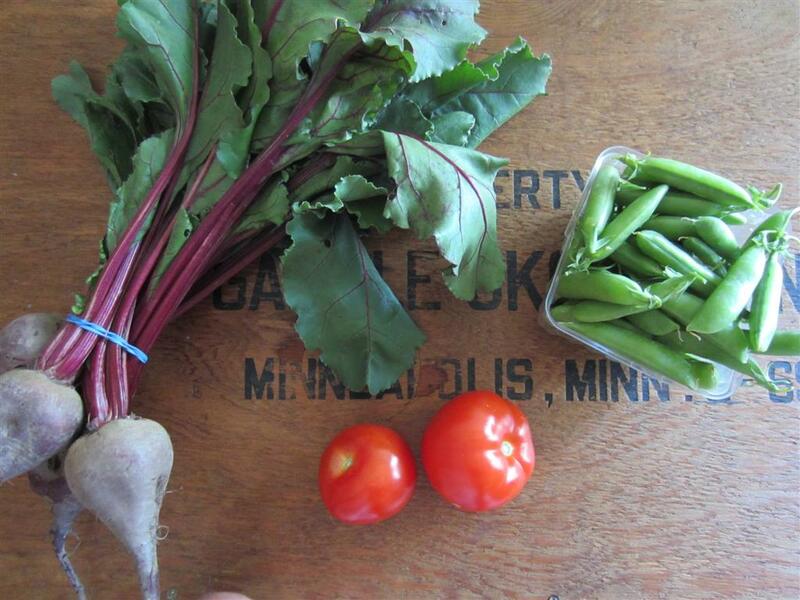 Katie: One of the great things about my new apartment is its proximity to the Westside Community Market. I got a chance to explore this weekly farmers market last Saturday. The last meal I made with beets was this Roasted Garlic and Beet Soup, but this time I wanted to try a more seasonal dish. I based my meal off of this recipe for Quinoa Salad with Roasted Beets, Chickpeas, and Orange from Gluten-Free Goddess, with some variations. 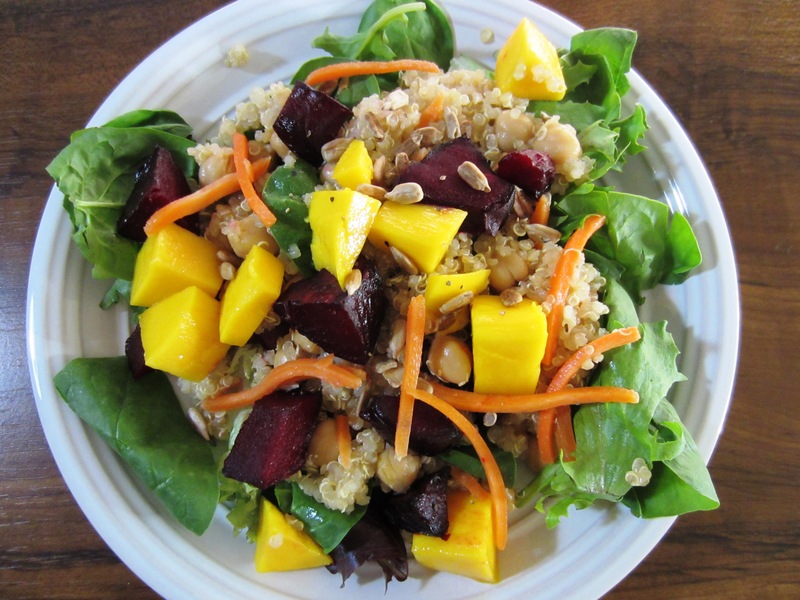 My salad included a base of greens, topped with quinoa, roasted beets, yellow mango, carrots, chickpeas, and roasted sunflower seeds! It was joined together with a dressing made of balsamic vinagrette, olive oil, soy sauce, and agave syrup. It may have been an unusual salad, but I really liked it! 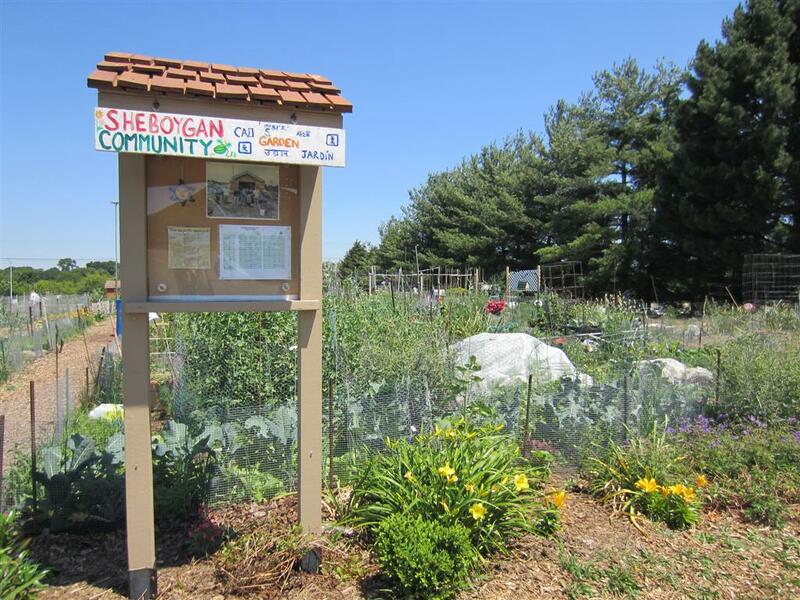 I hope I’ll have time this summer to explore the market more and try other summer salads! Katie: Since I’m on my own for meals this week, I decided to take the opportunity to try a few new recipes. It was chilly here today, so I decided to make some soup. 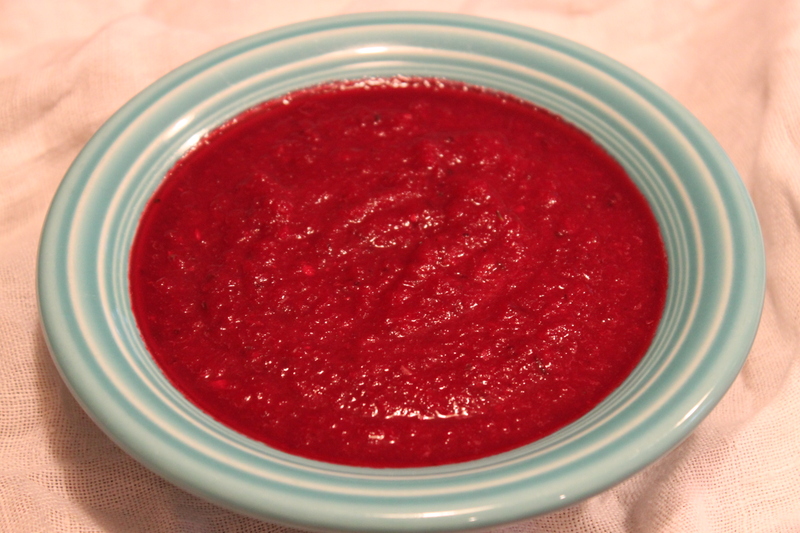 I found this recipe for Roasted Garlic and Beet Soup from Martha Stewart. It took awhile to roast the beets, but otherwise this soup was really simple to make. I forgot to add the lemon juice, but it still tasted great. I ate it with a dollop of ricotta, which was the perfect accompaniment! 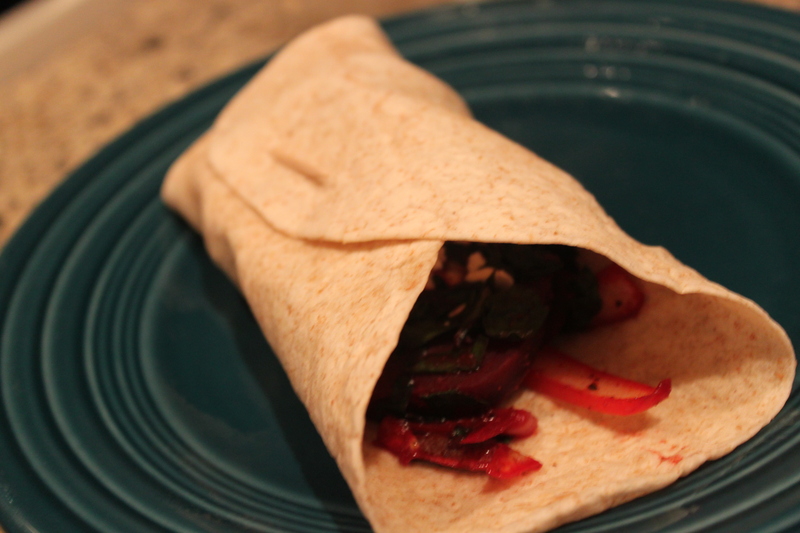 Heat oven to 400 degrees F. Drizzle beets with olive oil and roast in parchment-lined foil for 1 hour or until tender. Drizzle the garlic cloves with oil (I roasted a whole head), wrap in foil, and roast for 30-40 minutes. Unwrap beets, let cool, peel, and quarter. (Be careful not to get the juice on your clothes!) Squeeze garlic from skin. Set aside. Heat 2 teaspoons olive oil in a pot over medium heat. Add the leek and cook, stirring, until tender, about 6 to 8 minutes. Add beets and garlic, the herbs, the bay leaf, and 3 cups water. Season with salt and pepper. Bring to a boil, then reduce heat and simmer for 5 minutes. Remove the bay leaf. Let the soup cool slightly, then transfer to a blender and puree. Adjust the seasonings to taste. Serve with ricotta cheese or sour cream, as desired. 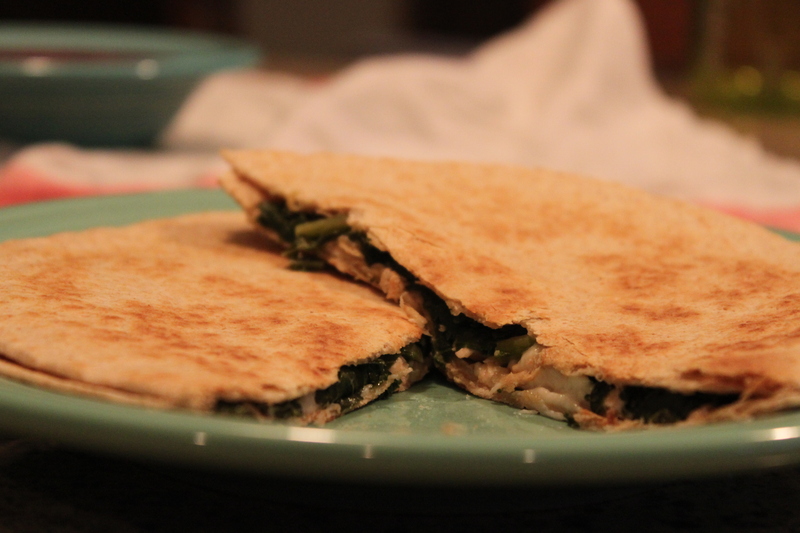 To go with my soup, I decided to use some leftover salmon in quesadillas. 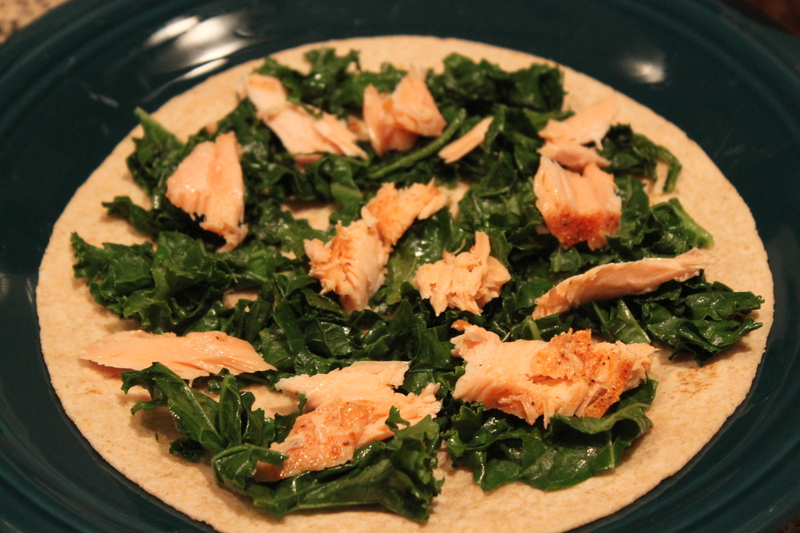 I followed this recipe for Salmon and Kale Quesadillas, which turned out great! If I made them again, I might try added other spices or some tomatoes, but I really enjoyed this combination of flavors. Katie: This weekend, I was confronted with something I hadn’t experienced in a long time: having to cook only for myself. While I always like the feeling of being able to cook for others and share a meal, I decided to use this as an opportunity to make something different that others might not appreciate as much as me! 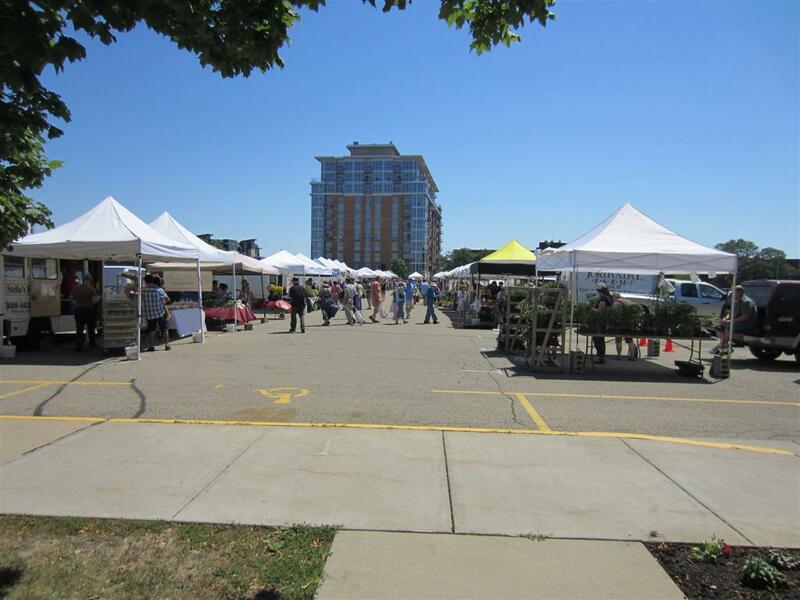 I went to the farmers’ market on Saturday morning, which was filled with stands of fresh, locally-grown produce. I chose some beets, which looked really good. 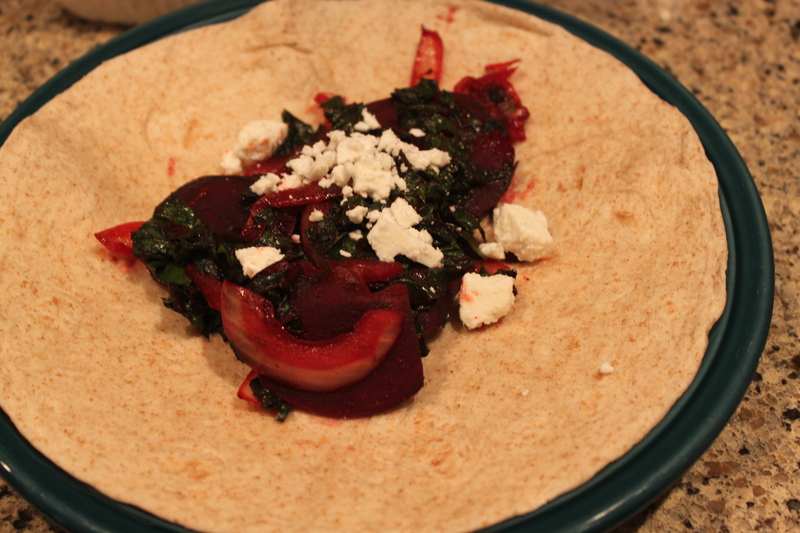 Since I had a leftover tortilla at home, I decided to make a wrap, adapted from this recipe for Beet and Greens Quesadillas. I really liked the combination of vegetables and spices, and the feta cheese was the perfect addition! I even had enough filling left over to use for another meal. 1. Heat oil in a nonstick skillet at medium-high heat. 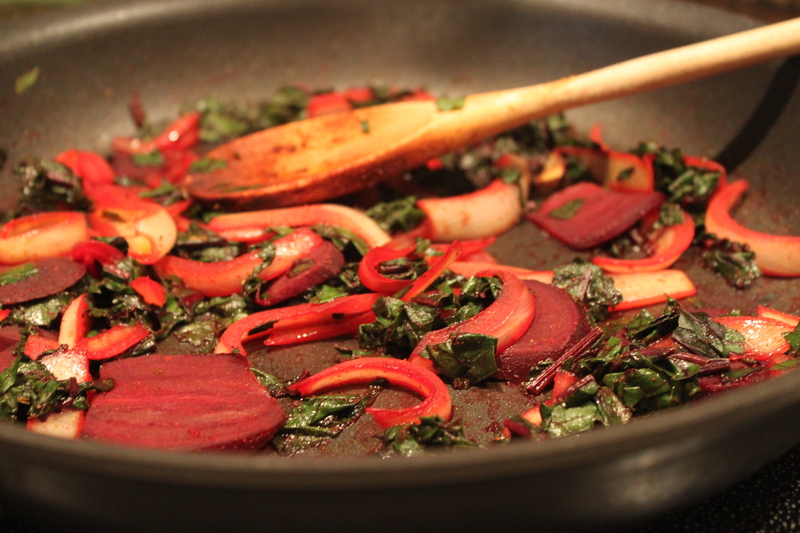 Add the onion and beet, and cook for about 6 minutes, stirring frequently. 2. Add the water, greens, chili powder, cumin, oregano, and salt, and stir until the ingredients are well distributed. Add a little more water if necessary. Cook over medium heat for 2 to 3 minutes, or until the vegetables are soft and all the water has evaporated. 3. Warm the tortillas in the microwave for about 15 seconds and top with the vegetable filling. Sprinkle with feta cheese, roll up, and serve. Enjoy!